Want to share your love of all things Wizarding World with your baby? 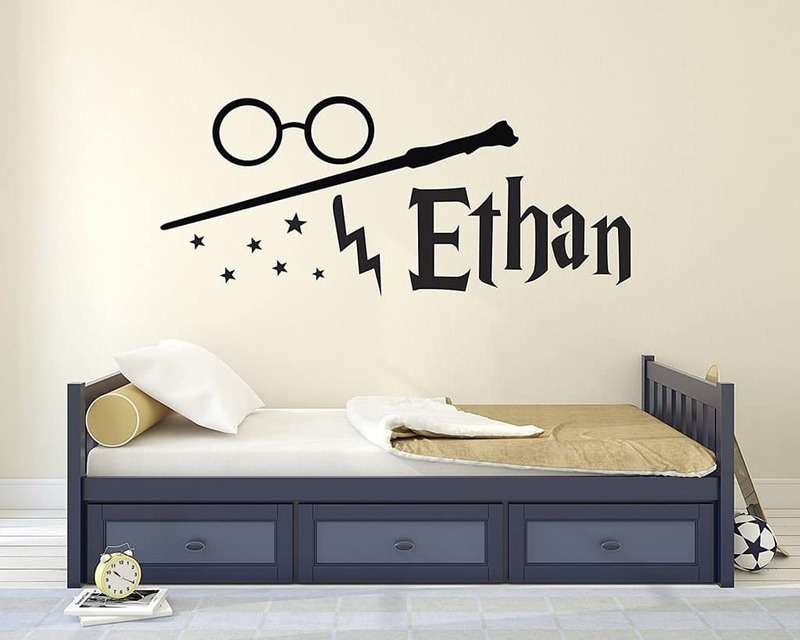 Check out these 12 darling Harry Potter nursery ideas that we’ve found for you! Whether you’re a fan of the books, the movies, or both, J. K. Rowling definitely created something special and long-lasting when she penned Harry Potter! Why not pass down your love of the stories with the next generation and welcome your new baby with a Harry Potter themed nursery? Here are some awesome World of Hogwarts nursery accessories to get you started! *Affiliate links included below. Thanks for your support! 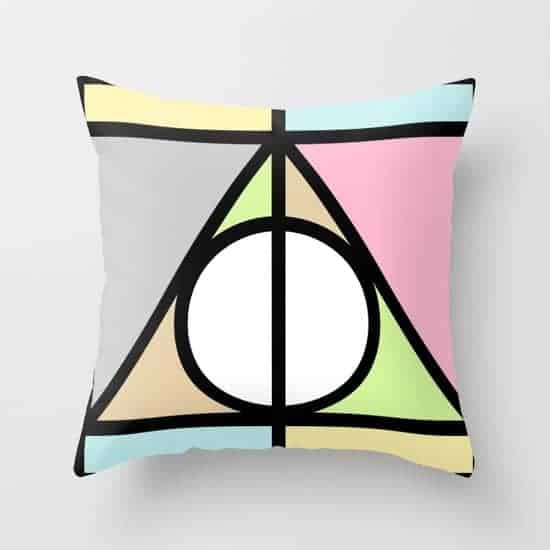 This colorful Deathly Hallows throw pillow makes a great addition to any nursery. The double-sided print pillow measures 16 inches by 16 inches. 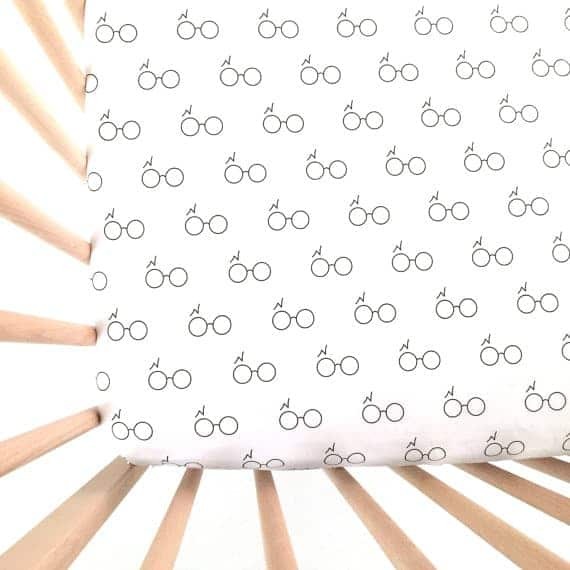 This 100% cotton fitted crib sheet features Harry Potter’s signature scar and round glasses. 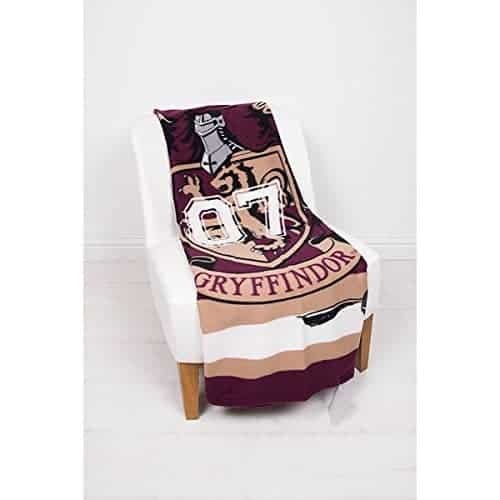 This fleece blanket is perfect for your future Gryffindor House student. 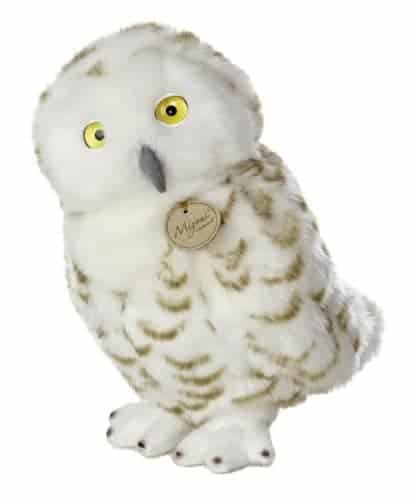 This realistic looking 9-inch snowy owl plush features thick faux fur. 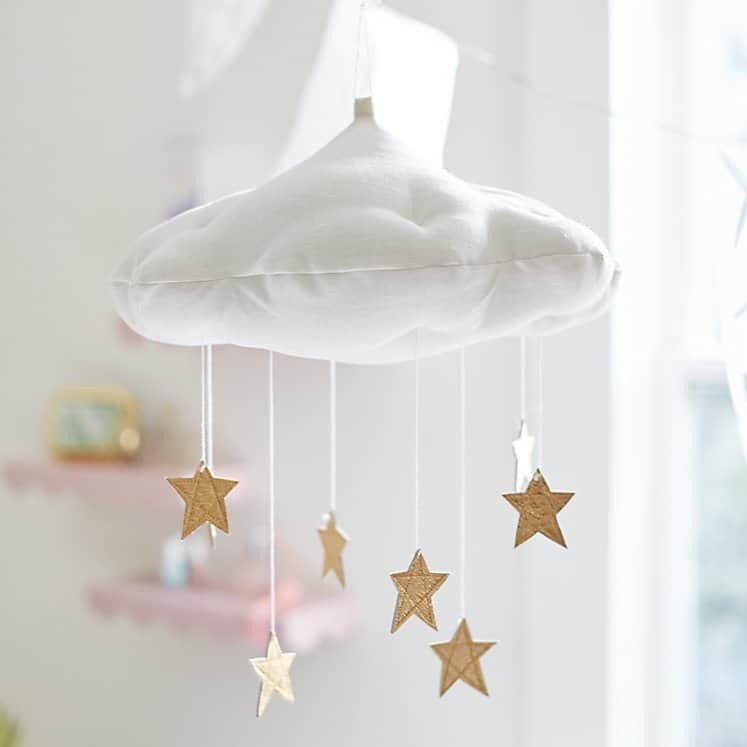 This puffy, white cloud with hanging gold stars mobile will look great over your little one’s crib. 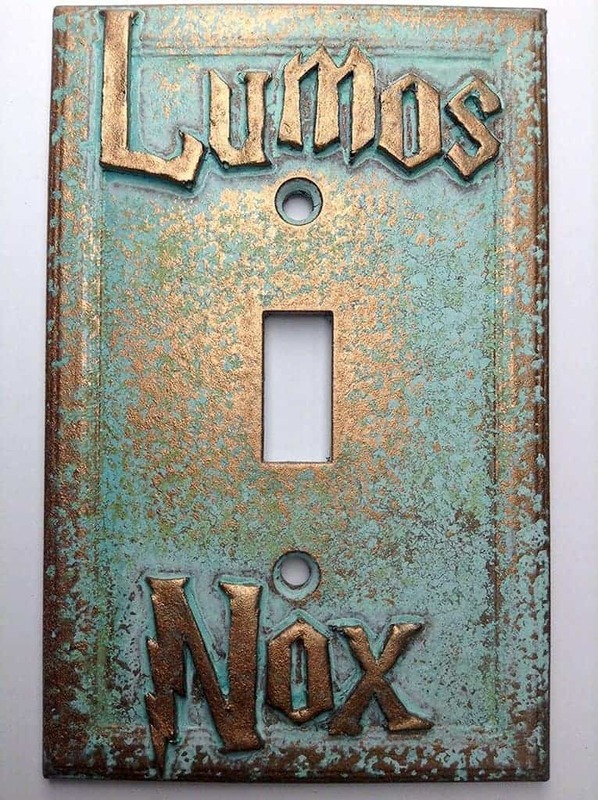 This embossed light switch cover features the famous Harry Potter font. You can choose from 3 different faux finishes: aged copper, patina effect or stone texture. This premium matte finish vinyl measure 16 inches high and 36 inches wide. You can choose from 48 colors customized with your baby’s name. 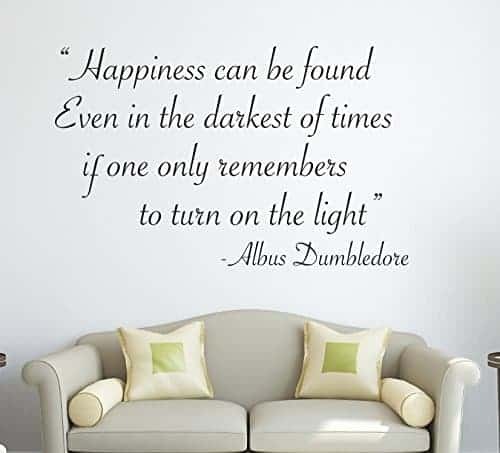 This 30-inch high, 19-inch wide, wall decal features a quote from the Headmaster himself, Albus Dumbledore! 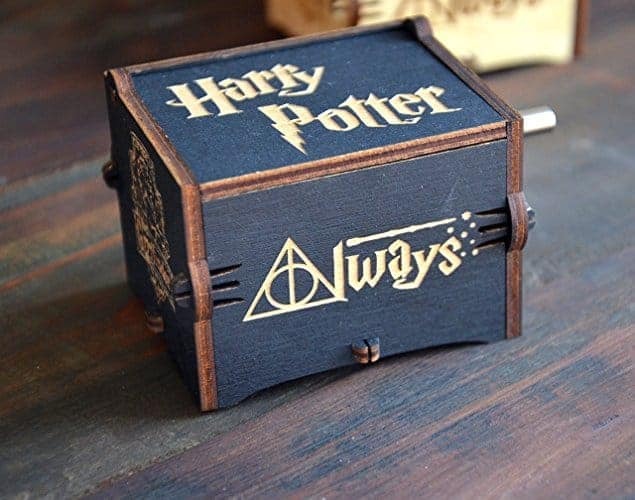 Soothe your baby to sleep with this wooden music box that plays Harry Potter’s main theme song, Hedwig’s Theme. This unique night light is the perfect addition to any nursery. It features 7 different color cycles with its LED 7-watt light bulb. 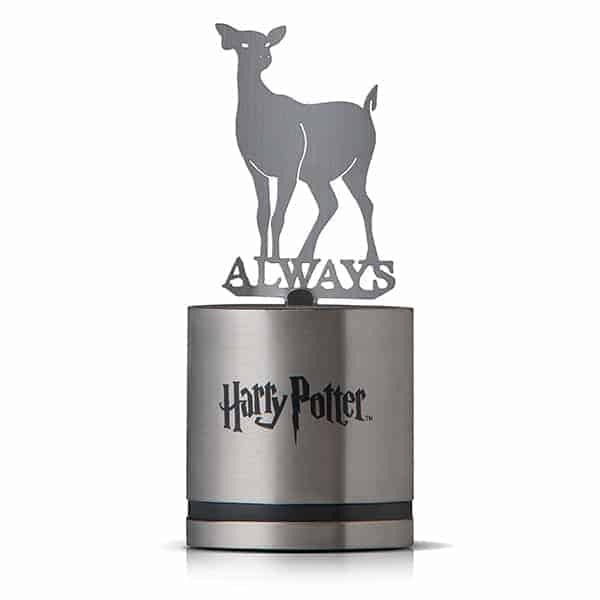 This novelty LED lamp showcases the Patronus doe of Severus Snape onto the nursery wall. The lamp features a soft light and a timer. I want all of these Harry Potter nursery ideas for my own room! Aren’t they just perfect for a baby’s room, though? Number 9 is definitely my favorite, and a must-have for any Wizarding World fan! Which of these Harry Potter nursery ideas is your favorite? Tell us below! Impress Your Kids With Cool Character Profiles & Trivia From Hotel Transylvania 2! It’s great to have a fun theme for a room. I really like the pattern of that pillow even though the name is a bit scary but those pastel hues makes it fantastic. I never knew there was so many Harry Potter items for babies! The fitted crib streets are my favorite, absolutely adorable! My fave has to be the harry Potter wall decoration. 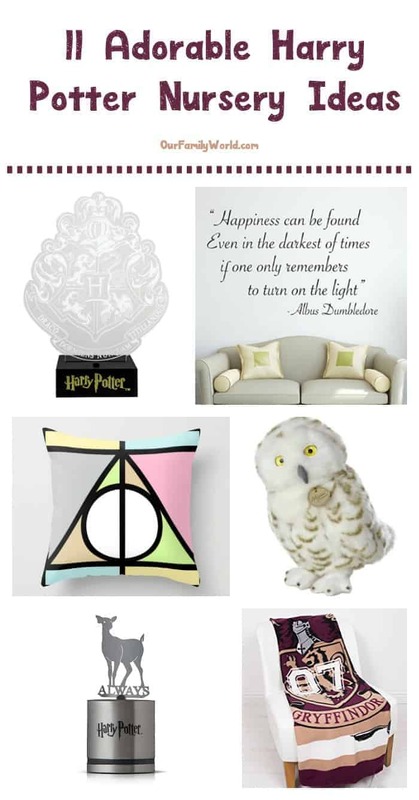 A great list for the nursery inspo, for us HP fans. I’ve never seen or read any of the Harry Potters, but I must admit, these decorations all look pretty awesome. I especially like the Dumbledore wall quote…I could see that having relevance in any room, not just the nursery! These are great stuff! Even a non Harry Potter fan, kids or adults will surely love these. My pick is number 2 ,4 and 9 those stuff are so neat, cute yet functional. 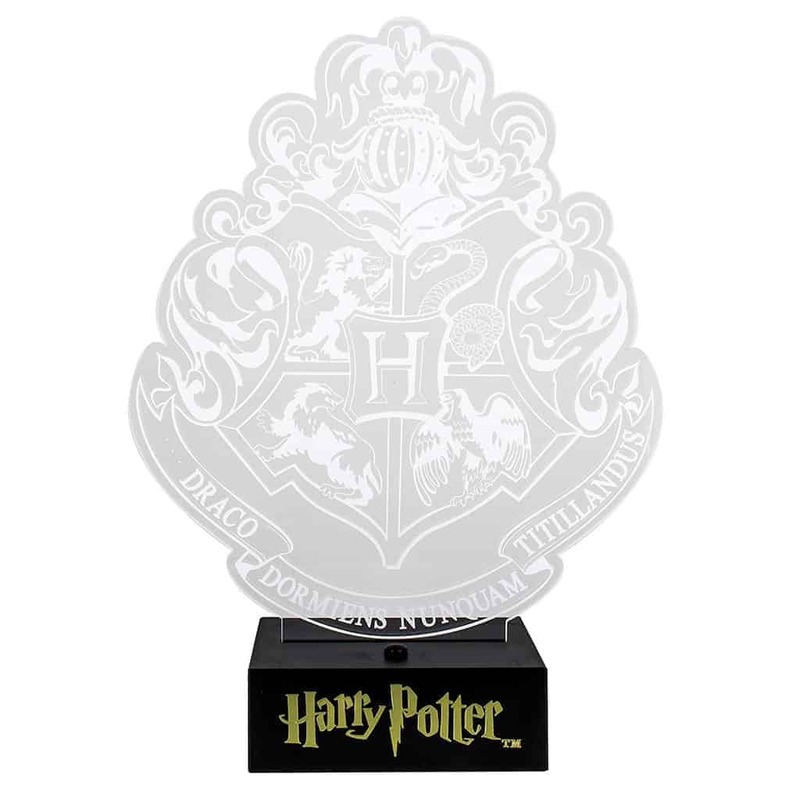 I am a fan of Harry Potter and I love the Luxe Star Cloud Mobile and the owl. It looks cute! I bet my daughter would love to have them on her bedroom. Wow. My son would absolutely love any of these. Especially loved the night lamp! This looks great! I agree, it’s good for a baby room but it would go very well in adults’ rooms too! I think my favourite is #6 but I’d love #9 just as a box to put jewellery or other stuffs inside! !